She voiced two criticisms of the displayed meme. First, she noted that it portrays cumulative donations over the candidates’ political careers instead of the donations they’ve received in 2016. While this point is true, it’s not very meaningful; in fact, one could easily argue that a cumulative look at donations received over several years provides more useful information about donors than a present-day snapshot. Either way, my piece stated upfront that the meme displayed cumulative donations. Our research over more than 20 years shows a correlation between individuals’ contributions and their employers’ political interests and we have also observed that the donors we know about, and especially those who contribute at the maximum levels, are more commonly top executives in their companies, not lower-level employees. The meme paints an accurate picture of the fact that Clinton raises a lot of campaign cash from big-money, corporate-affiliated donors. Sanders, on the other hand, doesn’t. Those who contend otherwise are wrong. In the interest of fairness and complete information, though, and because we now have data from the most recent filing period from the Center for Responsive Politics, let’s examine the candidates’ fundraising operations for their 2016 presidential bids more closely. 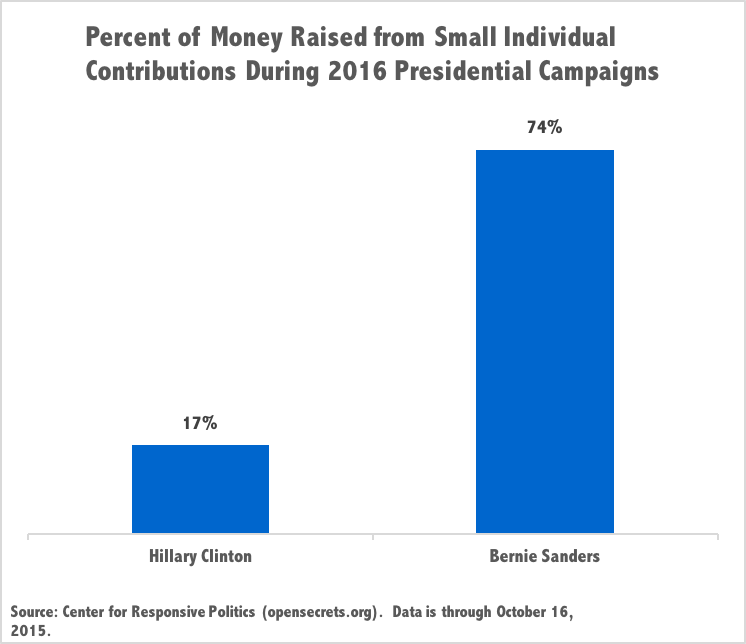 The first figure below shows the share of money each candidate has raised from small donations (donations of less than $200). A greater share of small donations indicates more grassroots support for the campaign, while a smaller share of small donations suggests that a candidate is more heavily reliant upon big-money interests. Over $30 million out of a little more than $41 million total raised by the Sanders campaign comes from small donors, while only about $13 million out of a little more than $77 million total raised by the Clinton campaign can claim the same origin. The next figure, like the criticized meme, depicts the larger donations the candidates have received. Unlike the meme, it focuses solely on contributions to the candidates’ 2016 presidential campaigns. 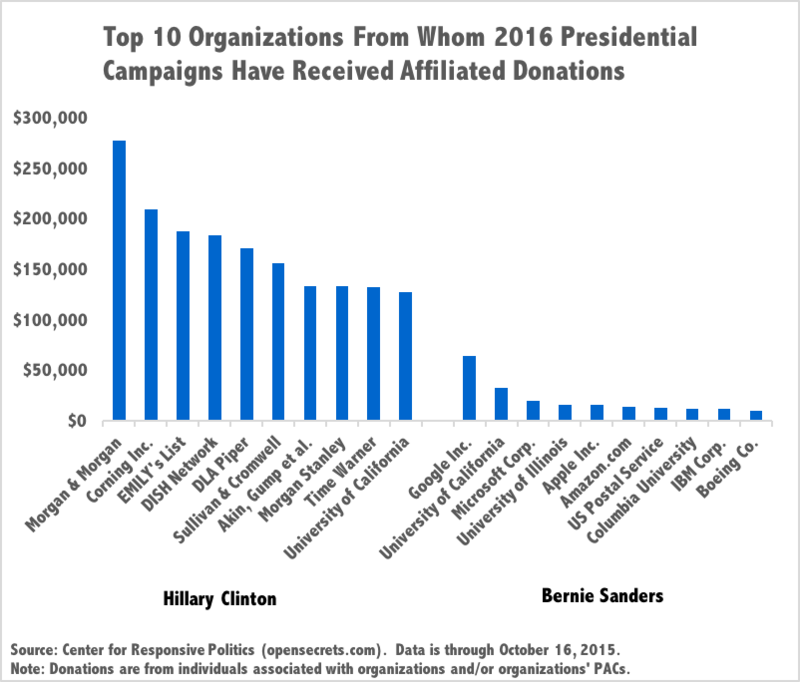 The fact that corporate donors make Sanders’ list underscores the one legitimate critique of the meme – $200+ donations from individuals at a given company don’t necessarily mean the company has thrown its support behind a candidate. 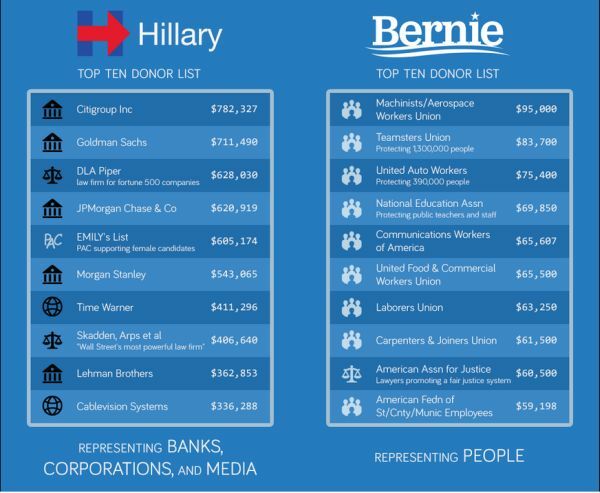 Yet combined with the first figure, the story here is very similar to that the meme presents: Clinton raises most of her money from Wall Street and other rich donors, while Sanders raises most of his campaign cash from regular people. Consider, for instance, that Clinton’s campaign has received a total of nearly $2 million in large contributions from individuals associated with the Securities & Investment industry. 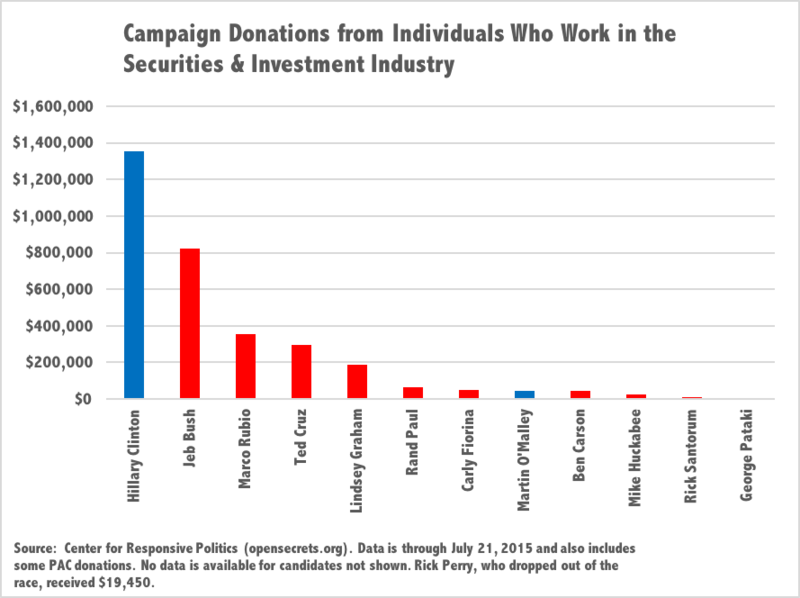 That industry barely cracks the top 20 in industry-affiliated donations to Sanders – Wall Street traders appear to prefer Clinton to Sanders by a 40-to-1 margin. 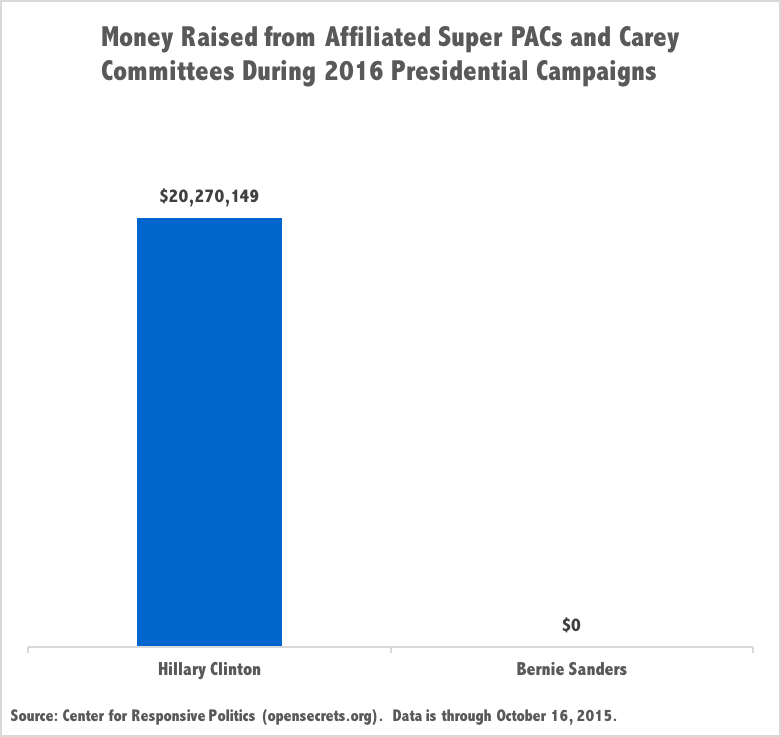 Finally, the figure below (adapted from an earlier post) depicts the amount of money raised on each candidate’s behalf by affiliated Super PACs and Carey Committees, which may be technically separate from the campaign but are in reality closely linked to it. Clinton has three – Ready PAC (formerly known as Ready for Hillary), Priorities USA Action, and Correct the Record, the last of which has already engaged in dishonest attacks against Sanders. Sanders has zero. Sanders does have a much more benign Leadership PAC, Progressive Voters of America, which he founded several years ago to help “elect progressive candidates at the federal, state and local level.” It has raised slightly more than $16,000. Two Super PACs have also sprung up to try and support him, but they are unwelcome in Sanders’ campaign, which sent one of them, Billionaires for Bernie, a cease and desist letter. Clinton, unlike Sanders, has not discouraged unaffiliated Super PACs from supporting her presidential bid. In other words, while Clinton has tirelessly continued to court the wealthy, Sanders has kept his promise and refused to accept Super PAC support. I’ve captured the highlights of this more current information in a new meme below. It clearly has the same punchline as the old one, and may even show a starker contrast between the two candidates’ fundraising operations. So if you’re not worried about the influence of money in politics or are an affluent donor yourself, Hillary Clinton might be an acceptable Democratic nominee. But if you want a politician more beholden to the people than to a wealthy few, Bernie Sanders is probably the better choice. Dmitri Mehlhorn, co-founder of StudentsFirst, wrote an article a few weeks ago about school funding titled, “How Money is Spent Matters.” That statement is obviously true; who could disagree with it? Unfortunately, the article’s actual argument – that “America’s schools are not underfunded” – is completely false. This post corrects the record. Funding for public primary and secondary education in the United States is, in fact, inadequate and inequitable, and rectifying this problem should be a top priority for anyone who cares about improving our schools. This analysis likely represents an upper bound on the degree of school funding equity in the United States. While California appears to have roughly equivalent funding for low- and high-income schools in the report, for example, there are major funding discrepancies between some of the state’s “basic aid” districts, which serve affluent students, and districts that serve lower-income populations. Within-district variations in spending also go undetected in the report’s metrics, as may situations in which funding that is supposed to follow high-need students doesn’t reach them. Inequitable school funding is a widely acknowledged problem, so much so that people associated with StudentsFirst – the very organization Mehlhorn co-founded – recognize that addressing it is imperative. Yet Mehlhorn’s article doesn’t mention the distribution of school funding at all, except when making misleading statements about charter school spending. Comparative spending between the two sectors is mixed, with many high profile charter network schools outspending similar district schools in New York City and Texas, but other charter network schools spending less than similar district schools, particularly in Ohio. Mehlhorn’s counterclaim that charter schools spend significantly less money than traditional public schools likely stems from a 2011 report from the National Center for Education Statistics, but it, like more cursory and flawed studies, may fail to appropriately categorize spending that should be assigned to each type of school. Transportation funding and spending on food services and special education, for example, can be misclassified in such analyses. In addition, students in traditional public schools perform just about as well on average as students in charters; as Harvard professor Tom Loveless has explained, the differences in student test score results between the two sectors “are extremely small, so tiny, in fact, that they lack real world significance.” Mehlhorn’s inaccurate claims to the contrary rely on a completely invalid “months of learning” conversion performed in a recent study of urban charter schools; the study actually shows a tiny difference between the charter and traditional public school sectors (less than .06 standard deviations, or a good deal less than one additional question answered correctly on most tests). In other words, there’s only one real conclusion that can be drawn about the research on overall levels of charter school funding and average student test scores: arguments touting charter schools as a low-cost solution to boost student achievement are either uninformed or deliberately misleading (especially because the student populations charters serve are typically unrepresentative subsets of the surrounding traditional public school populations, and because many studies don’t distinguish school effects from peer effects). At the beginning New Orleans was spending about $8,000 more per pupil relative to similar districts. In other words, spending didn’t quite double, but it came pretty close to doubling in the initial years. And then it converged back to the normal, or close to normal rate. Now they’re spending about $1,000 more per pupil than similar districts, whereas before the storm they were spending close to the same as those comparison districts. Either way, to the extent that best practices in certain successful charter schools drive their results, these practices can likely be replicated in traditional public schools that receive more adequate funding, as research by Roland Fryer suggests. Especially because rapid charter school expansion has often led to harmful side-effects (in New Orleans, the large-scale firing of Black teachers and inattention to community preferences are poignant examples), our efforts are best focused not on promoting charters, but on adequately and equitably funding all schools, thus enabling them to implement best practices that may include but are not limited to better teacher training and support, more competitive teacher pay (to facilitate recruitment and retention), reduced class sizes, extended learning time, expanded tutoring availability, and enhanced extracurricular opportunities. There’s also a very strong research basis to support increased school funding – a research basis at least as strong as, if not stronger than, that behind practically any other education policy proposal. Mehlhorn’s article elevates shaky empirical work from 25 years ago by Eric Hanushek (and work from nearly 50 years ago by James Coleman) to argue that money isn’t particularly important while downplaying the much larger body of more recent and careful research that comes to the opposite conclusion. Third, sustained improvements to the level and distribution of funding across local public school districts can lead to improvements in the level and distribution of student outcomes. While money alone may not be the answer, adequate and equitable distributions of financial inputs to schooling provide a necessary underlying condition for improving adequacy and equity of outcomes. A new high-quality study by C. Kirabo Jackson, Rucker Johnson, and Claudia Persico comes to the same conclusion. Mehlhorn’s article also mentions this study, but misinterprets the results; it mistakenly compares the invalid “months of learning” statistic from the charter school research discussed above (which actually represents data on student test scores) with Jackson et al.’s data on completed years of schooling. The researchers’ claims here are overstated – they’re extrapolations beyond the actual results that, while less misleading than the “months of learning” statistic, are still misguided attempts to help a broader audience understand research findings – but it’s important to note that the magnitudes are very large relative to the results in most education studies. It’s also worth noting that even Hanushek, who is one of the only researchers who continues to question the importance of school finance reforms, has never said that money never matters (Mehlhorn’s article gets that point right) and has admitted that schools serving more disadvantaged students should receive more funding. The best, though, imperfect way, to understand how well America is spending money on education is look at how much other nations – most-notably highly-touted Finland and South Korea — spend on their schools. In general, the OECD data shouldn’t be used for cross-country comparisons; it doesn’t count spending the same way in each country and likely makes US spending appear larger relative to spending in other countries than it actually is. To the extent that the data can be illustrative, however, the appropriate approach would exclude college costs and private spending and focus on K-12 public school spending as a share of the economy (as opposed to using raw numbers; spending as a share of GDP provides a better indication of how much a country spends relative to what it can afford). Doing so (see Table B4.1 here) indicates that public spending on primary and secondary education in the United States, relative to GDP, is lower than spending as a share of the economy in Finland, the same as such spending in Korea, and slightly below the OECD average. Again, the data is flawed, but it likely provides a high-end estimate of United States education spending relative to such spending elsewhere. Mehlhorn’s article also paints an incomplete picture of historical levels of education funding in the United States. The fact that K-12 spending has risen in inflation-adjusted dollar value terms over the past 45 years doesn’t tell us anything about whether school spending levels are sufficient, and real spending on practically everything has increased in dollar terms since the 1970s; in fact, real spending should increase as our economy grows. A more appropriate (though still imperfect; one flaw is that it’s not adjusted for changing demographics) look at K-12 public education spending in the United States reveals that we are spending approximately the same amount relative to the size of our economy that we were several decades ago. What’s more, K-12 education funding has declined significantly even in real dollar terms in recent years; during the 2014-2015 school year, 35 states were still providing less total state and local per pupil funding than they had been providing before the Great Recession. Title I funding for low-income schools and special education funding have also fallen since 2010. Finally, it’s important to remember that even if aggregate funding levels were higher, aggregate numbers don’t speak to the distribution of funding. 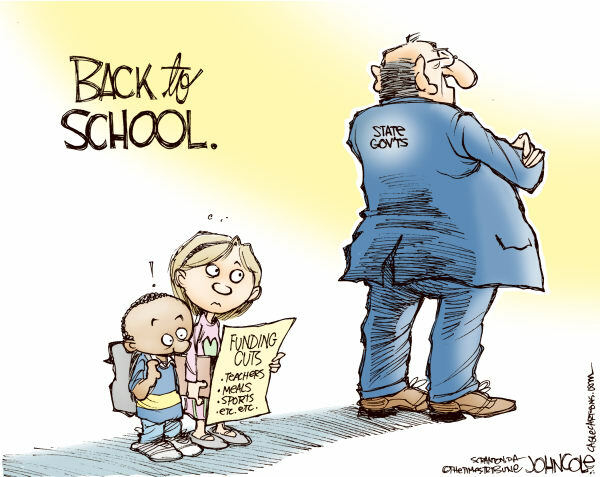 We’ve yet to target and sustain increased funding in schools that serve our neediest students. Especially when it comes to low-income areas, America definitely can – and should – invest more in K-12 public education. Increased funding, to be useful, must of course be spent in smart ways. Money by itself isn’t a panacea. But it’s important to get the facts right: money matters, and it matters quite a bit. It is incredibly counterproductive to pit increased funding and smart spending against each other (though Mehlhorn’s piece acknowledges “that money spent properly can be helpful in improving achievement,” it balks at the idea that schools need additional funding), especially when schools serving the most disadvantaged students tend to get the fewest resources. Giving schools more money and making sure they spend that money wisely are complementary, not competing, goals. Pitting education funding against social insurance and safety net spending, as former Tennessee education commissioner Kevin Huffman did in a recent article, is also absurd. While it’s true that adequate income support and health care matter most for low-income students and that school-based reforms cannot, contrary to Huffman’s assertion, “be the lynchpin of social mobility in America,” schools are still very important. Those truly committed to an equal opportunity agenda should stop taking potshots at its components and start getting to work on raising the revenues necessary to implement it. In America right now, we unfortunately don’t pay for the education system our students deserve. Until we do, we won’t get it. Update (11/5/15): Mehlhorn has written a new article that is supposed to be a response to this piece but that barely attempts to rebut any of the actual claims in it. Instead, its argument is mostly that the factual errors and omissions that I discussed above are unimportant. I’ve already explained why many of the article’s sections are misleading, particularly those about the school-funding and charter-school research (Mark Weber has also chimed in on charters), and I’m confident that the vast majority of education researchers (and others who have read the research in question) will agree that my summary is more accurate. 1) Mehlhorn devotes a lot of space to attacking Bruce Baker for editorializing. Baker certainly does have strong opinions, but I actually think it’s nice that he’s transparent about his perspective – all researchers have biases, and it’s in many ways preferable to know about them upfront. 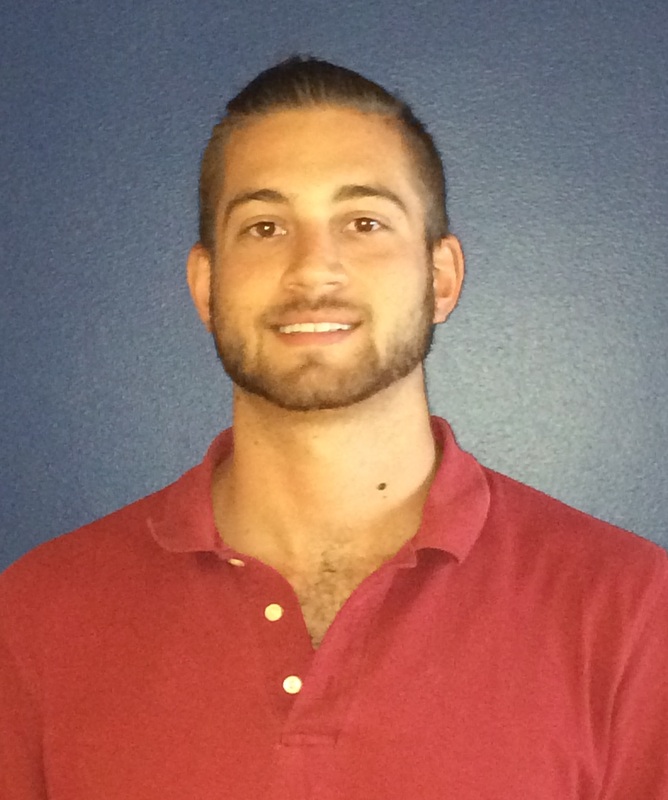 Baker’s work is strong and consistent with other recent research. The research Mehlhorn relies on – from Eric Hanushek, a member of the Right-wing Hoover Institution (note that Mehlhorn does not once mention Hanushek’s affiliation and biases) – is typically much older and a clear outlier (as I explained above). 2) David Dayen recently wrote an excellent piece about why citations of raw numbers for government spending – of the type that appear in Mehlhorn’s piece – are misleading. I highly recommend it. Mehlhorn is also mistaken about historical trends in real (inflation-adjusted) spending outside of education; as a quick look at the data for some of the categories he mentions (like certain technologies or defense) confirms, spending on (which is different than prices of things in) these categories has also grown over time (though by different amounts than education spending and not on a per capita basis for defense, which it would have been fine to point out). One fair point Mehlhorn does make is that inflation-adjusted spending levels have value. I used spending as a share of GDP above to note that the US spends less on education relative to what we can afford than many other countries and that our education spending relative to what we can afford hasn’t changed much over time. Those facts in and of themselves don’t necessarily mean that our spending levels are insufficient; they just show that our investment in education is consistent with historical and international norms. But while it’s fine for Mehlhorn to note that per-pupil spending in the US is up significantly in real terms since the 1970s, that also doesn’t necessarily tell us anything about whether spending levels are sufficient. We may have been spending way too little in the 1970s, and we still may be spending way too little now. In any case, Mehlhorn’s note that education spending has increased more than test scores doesn’t say anything, by itself, about the efficacy of that spending. Student test scores are influenced more by outside-of-school factors than by school-based factors and it’s impossible to know how effective an intervention was without knowing what would have happened in the absence of the intervention. Maybe test scores would have fallen if spending had remained flat. We don’t know. What we do know is that studies that attempt to identify a counterfactual, like Jackson et al.’s, indicate that increased school funding makes an important difference. As I’ve repeatedly noted, money also has to be well spent. But while increased funding for schools serving the neediest populations is not sufficient, it is necessary. Update 2 (5/1/16): Mehlhorn wrote two additional pieces on this topic, one of which repeated most of the errors in his first “rebuttal” and the other which attacked Baker. He has insisted on Twitter that these pieces are fair. In truth, anyone stumbling across them will be wildly misled. After Mehlhorn commented on another blog post I wrote about a different topic, I made him an offer: I would catalogue exactly why I find his responses in this exchange to be disingenuous, and we would sit down and chat in person before he wrote anything else on the topic. Mehlhorn agreed. The piece linked below reviews in detail five areas in which Mehlhorn has continued to distort the facts and/or gotten them completely wrong. There are reasonable disagreements to be had on school funding issues, but these aren’t some of them. Mehlhorn’s mode of argument has often been to claim point X and cite “facts” A, B, and C to back X up. When I show that A is wrong, B is misleading, and C provides incomplete information, Mehlhorn says, “X is still true. So what if A, B, and C weren’t support for it; look at D and E.” When I then show that D and E are misleading, Mehlhorn pivots to point Y and accuses me of disagreeing with Y throughout our earlier conversation. I don’t think this approach constitutes good faith engagement. I actually enjoy the discussions I’ve had with Mehlhorn in person thus far and hope that the conversation following this update goes well. I also hope he will update his prior pieces with transparent corrections that note that the pieces were initially riddled with factual errors (knowledge about the evolution of articles is informative for readers). It is perfectly fine for him to still disagree on certain points, and I would still be happy to consider any legitimate arguments he makes in the future (as I did in the update above). Without further ado, here is the description of the errors he should correct. Update 3 (5/3/16): Mehlhorn and I had a good conversation and he has posted a new piece that contains some clarifications of his positions. I very much appreciate his engagement and his willingness to hash things out in person. I also learned from the discussion myself. Many of Mehlhorn’s conclusions are still off-base, I believe, and he hasn’t corrected all of his earlier errors yet, but since we’ve debated this issue at length already and he has made a good-faith effort, I’ll leave it here for now. Sure, Clinton’s plan has, as financial systems expert Mike Konczal notes, significantly more “footnotes and wonky details.” If that’s what “more comprehensive” means, so be it. But tougher? More “characterized by severity or uncompromising determination,” as Merriam-Webster’s puts it? Which of those options sounds tougher to you? Clinton didn’t possibly expect anyone to believe that she’d be tougher on Wall Street than Sanders, did she? Krugman points out, as does Konczal, that while Clinton has already laid out details on how she plans to conduct oversight of the “shadow” banking sector, Sanders hasn’t. Krugman sees a specific plan in this area as more important than a commitment to break up the big banks. This argument is fine to make, though it’s worth noting that Reich disagrees. But the more important topic, Krugman argues, is tough-on-Wall-Street credibility. And what’s baffling to me about his analysis is that he seems to think Clinton has it, a position completely at odds with the campaign finance data and Clinton’s record. Financial tycoons loom large among the tiny group of wealthy families that is dominating campaign finance this election cycle — a group that overwhelmingly supports Republicans. Hedge funds used to give the majority of their contributions to Democrats, but since 2010 they have flipped almost totally to the G.O.P. Krugman is right about the overall trends. A tiny group of wealthy families is contributing millions of dollars to 2016 presidential campaigns, most of it to Republicans, and the balance of hedge fund donations between the two parties has definitely shifted. But those overall trends mask one crucial exception to the rule: Hillary Clinton. 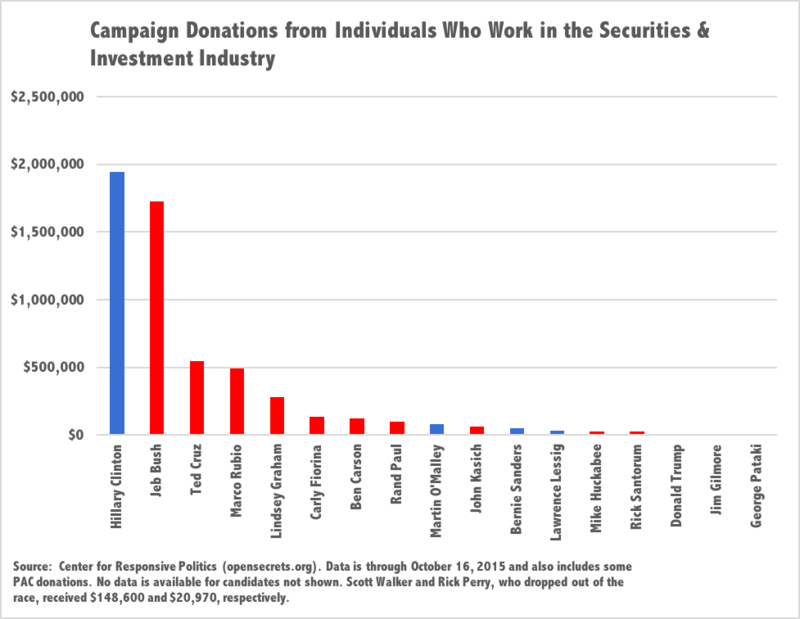 As the chart shows, Clinton actually leads all Republican candidates in contributions from this industry. 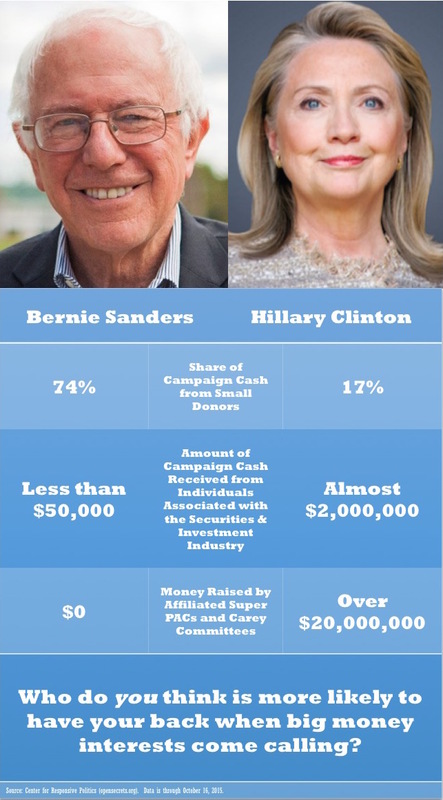 She has received over 40 times more money than Sanders has from individuals associated with Wall Street. That’s lopsided giving all right, but it’s lopsided in a much different way than Krugman suggests. 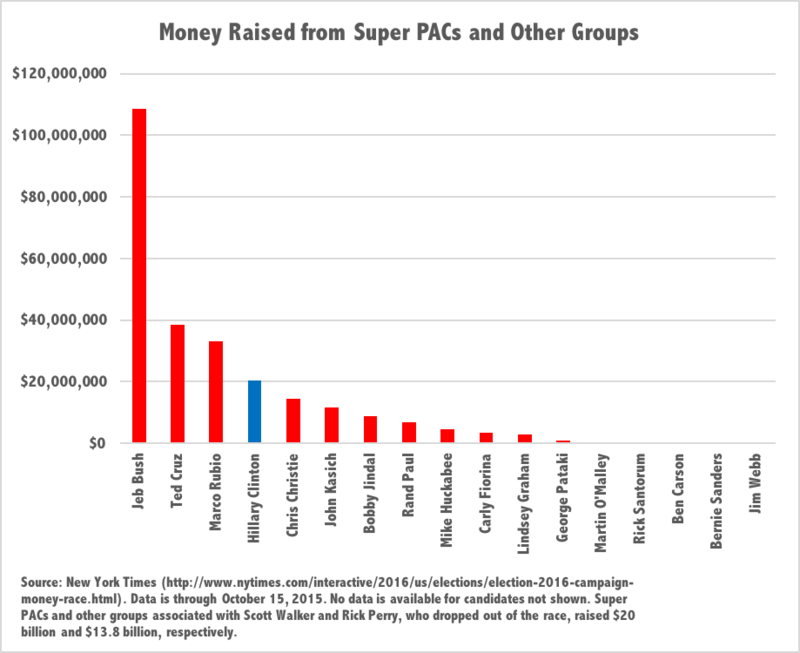 Candidates receive considerably more financial support from Super PACs than from individual donations, but Clinton ranks among the Republicans in this category, too. Jeb Bush, Ted Cruz, and Marco Rubio outpace her (Bush by a considerable margin), but her $20.3 million in Super PAC money is exactly $20.3 million more than Sanders has received. While it’s not clear how much of any candidate’s Super PAC money comes from Wall Street, and while I suspect that Clinton Super PAC donors George Soros and S. Donald Sussman are more amenable to basic regulations than their fellow billionaire hedge fund managers who donate to Republicans, it seems plausible that a “victorious Democrat” – if that Democrat were Hillary Clinton – might, in fact, “owe much to the financial industry.” And that’s before even considering donations to the Clinton foundation. Those donation profiles suggest that Sanders, despite not having a specific proposal on “shadow” banking yet, is far more likely than Clinton to fight for smart recommendations from folks like Konczal. I don’t know about you, but I don’t typically think representing a group of rich people and giving them a nonbinding but stern talking to qualifies as particularly tough. History backs me up on this one – Clinton’s Wall Street lecture doesn’t seem to have worked out so well. Paul Krugman is a great economist, I love his column, and I understand the point he’s trying to make: he thinks a Democrat in the White House – any Democrat – would be a hell of a lot better than any Republican. But even if you agree on that point, don’t buy the idea that the practical difference between Clinton and Sanders is trivial. It’s very large when it comes to Wall Street, where Sanders is tougher by any reasonable definition of the word. Update (5/12/16): The Wall Street Journal reports that “Hillary Clinton is consolidating her support among Wall Street donors and other businesses ahead of a general-election battle with Donald Trump, winning more campaign contributions from financial-services executives in the most recent fundraising period than all other candidates combined.” In addition, “some Wall Street donors have shifted their financial support from Republican candidates who dropped out of the race, such as former Florida Gov. Jeb Bush and Florida Sen. Marco Rubio, to Mrs. Clinton in recent months.” The most recent data from the Center for Responsive Politics, shown below, includes both donations made directly to the campaigns and those made to candidates’ Super PACs.